This is a step by step guide to show you how to scale the image size of an existing gif. 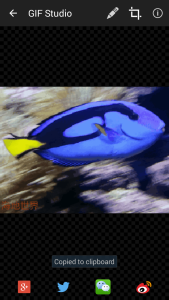 GIF Studio can scale the width and height of the photo to precise pixel values. This is especially useful to share the gif to social networks that have gif size constraints. 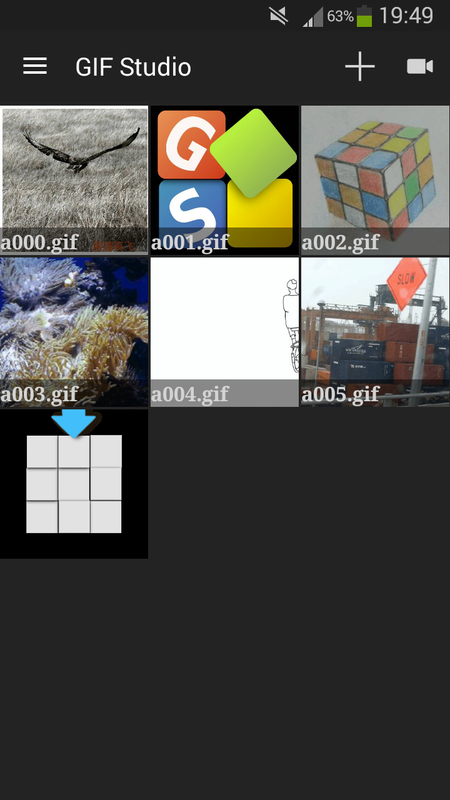 In the GIF Studio “Album Screen”, click on the animated gif to open the “Playing Screen”. 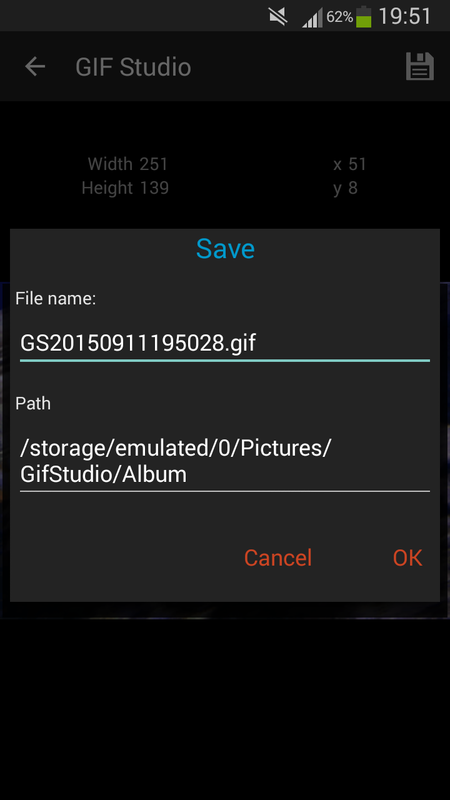 Alternatively, user can use “My Folder” or “Gallery” Apps to locate the file and share via “GIF Studio”. This would automatically open the “Playing Screen” which is shown in Step 2. In the “Playing Screen”, You can view the animation and change its playing speed by sliding up and down. Click “Editor” to modify the gif’s size on the top right of the screen. In the “Gif Configuration Screen”, change the image size by sliding the horizontal bar to left or right. Alternatively, user can key in the width/height values in the text fields directly. 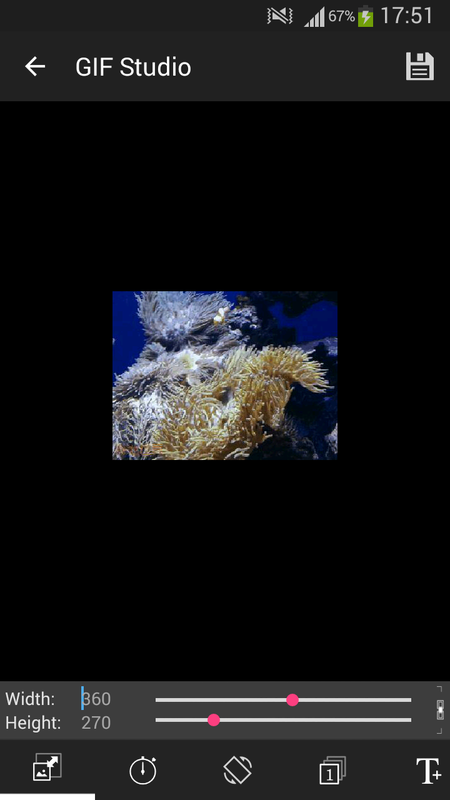 If you change the width of the image, the height will be updated automatically. The app will keep the image width and height ratio by default. User can unlock the image ratio by click the icon in the bottom left of the screen. Press “Save” icon at the top right of the screen to store the file to the phone. In the “Output Configuration Screen”, user can rename the file or select a different path. The “Playing Screen” will pop up after the saving process. User can choose to share the animation with friends or do further editing. 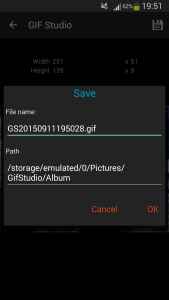 The default output path is in /sdcard/Pictures/GifStudio/Album folder.